Propane heaters are particularly effective at heating garages. As garages are usually drafty places, it is important to have a powerful heater to provide the needed warmth. Electric is commonly used for this. However electric heaters tend not to be so effective, requiring a lot of electricity to generate enough warmth, making them costly. Propane is far more cost-effective. People often wonder if it is safe to use a propane heater in a garage. While it is safe, there are a few things to consider so that you use your heater correctly. There must be enough oxygen, which is usually not an issue in a drafty garage. Without enough oxygen, the poor combustion can cause carbon monoxide to form. Garages are actually a great environment to avoid this. Equally, make sure your heater is away from anything flammable, and that there is nothing cluttering the heater. If your garage is poorly ventilated, a propane heater is perhaps not for you. If you are looking to move your heater around, you need to consider how portable the heater is. Some models come equipped with ergonomic carry handles and lightweight designs to make lifting easier. Other, usually larger models can also be found with wheels. Try to look for reviews that highlight durability if being transported frequently in a car or truck. If you’re choosing a model that isn’t portable and needs to be installed, consider where you will place the heater. Measure this space to find a heater that fits. While ensuring that it can structurally hold the weight. Lightweight designs with easy installation are best, or you will need to hire an installer, adding to the cost. Consider the size of the space that needs heating. 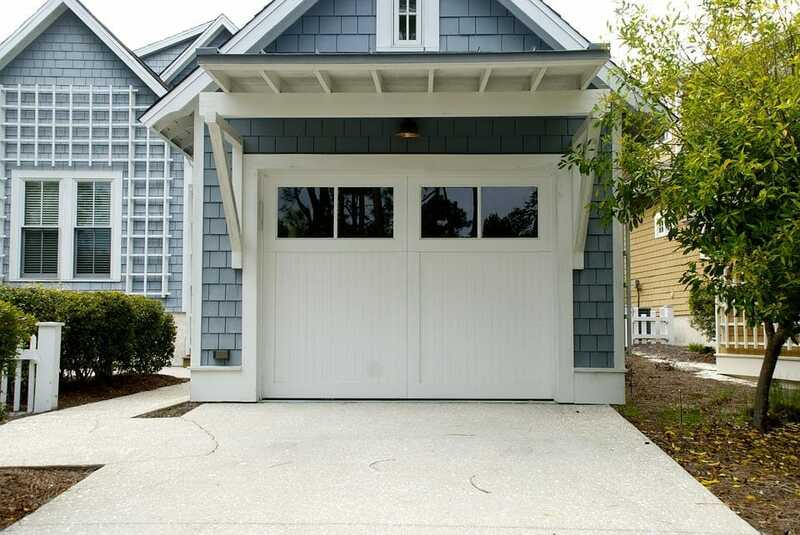 Garages are large as well as drafty, so you’ll need to consider that when a heater might say it heats 1000 square feet. Hot air is lost more easily in a garage. You will need something with slightly higher power and efficiency than you would for a regular, insulated interior room. While still being able to fit it into the area you have for it. Not only do you want your product to cost less, but you also want it to be cost-effective. This means that you need to consider the running costs and thinking about the initial price. When it comes to garage heaters, well-insulated and well-vented garages will be better served, with lower running costs. Equally, a heater that can cope with your needs without over-performing will run at a lower cost. Make sure you measure effectively and calculate the power you need. And search for a product in your price range that meets that. Technological advancements have brought an array of added extras. Integrated thermostats will allow you to set an even temperature for your room. While automatic ignitions are far more convenient. You may want remote control or to have specific settings. Or maybe you are keen for a digital display. There are all manners of features to improve operation and convenience. Look for models that have tip-over protection to make the user aware if the heater is falling over. Equally, overheat protection will prevent the device from overheating. Look for heaters that incorporate carbon monoxide safety measures as well. Propane is cheaper to use than electric, making electric heaters more costly to run. In fact, propane can cut down energy costs by a third. With this in mind, propane can get hotter than electric, heating rooms far more quickly; also reducing the costs. Propane products tend to have a longer lifespan than electric products. They are more durable, and the clean fuel prevents the components from breaking down, increasing longevity. That said, electric heaters are usually cheaper up front. Electric heaters tend to be silent. Whereas propane heaters are a little noisy, which makes them less suitable in the bedroom. However, electric heaters that have a fan can also make a mechanical sound. For those who live in areas with unreliable electricity, electric heaters won’t be able to cope in the stormier, colder months. Propane tanks can be stored safely in your garage, serving as a heat source even if the grid goes down. This is equally true for people who don’t have electricity run to their garage. Instead, propane tanks can be easily installed, and the garage can be heated without installing cables. If it gets particularly gusty in your garage, the wind could blow out the flame for the propane, making it harder to light. Electric heaters are slightly easier to get going. Take a look at these reviews below to get to grips with some of the best propane heaters for a garage installation. Available on the market today, these models give a large display of options for all price ranges. With 60,000 BTU heat output, this forced air heater is able to pump out enough heat to warm 1,500 square feet. On a 20-pound propane tank, this heater can run for 11 hours. It has variable heat settings and comes with all fuel attachments. The variable heat settings enable easier operation. All attachments are included, for simpler installation. This model heats the room quickly without eating too much energy. The powerful fan mechanisms propel the air evenly around the room. There is no thermostat, so it needs to be turned on and off manually to create an even temperature. There are no safety features added to this model, making it a hazard for those with children and pets. ​This is a great basic design for someone looking to heat a medium-to-large space, without a great deal of fancy installation. It is effective and simple, but perhaps not suitable for those with pets. This propane heater is designed specifically for garages. 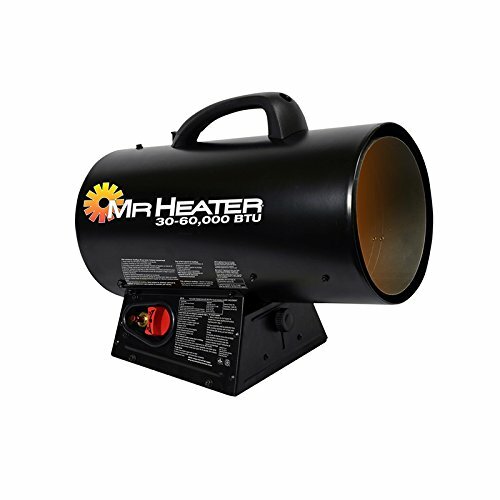 With a 40,000 BTU output, this heater uses cost-effective infrared technology to radiate heat. It can heat up to 1000 square feet and has a thermostat. The infrared technology makes this heater silent and odorless. There is no maintenance needed as there are no moving parts. The infrared technology is very cost-effective lowering running costs. It can be swiveled up and down to direct heat to particular people or objects in the room. The instructions are not very detailed and cause confusion. This is not portable and must be fixed to the wall when installed. ​This heater is a good option for medium-sized garages. It heats quickly and efficiently, with low running costs. While it doesn’t have a fan, it heats people directly. The installation allows the user to direct heat but isn’t really a portable option. Operating for 17 hours on a 2lb tank of propane, this heater gives out 25,000 BTU of heat, while heating 625 square feet. All gas fixtures are included, and a standing pilot is installed to increase the safety. This is a long-lasting heater for small spaces. This model is very fuel efficient, lowering running costs. There is a Piezo push-button igniter for much easier starting. Propane tank installation is incredibly easy, with simple instructions, and all fittings included. It lets off a strange metallic burning smell when first used. This device does not include any safety features beyond the standing pilot. ​This heater is most suitable for smaller garages that have a lot of ventilation. They are easy to light and the low fuel usage means they don’t need to be refueled so often. With 60,000 BTU of heat output, this model can war up to 1500 square feet. With variable heat settings from 30,000 to 60,000 BTU, this model device can run up to 14 hours without refueling. The QBT technology makes it 50% quieter than similar heaters. The high output fan forces air around, heating the garage quickly and evenly. This model operates more quietly, not disturbing the workspace of the garage. The variable heat settings allow you to set a more comfortable environment and create versatility. 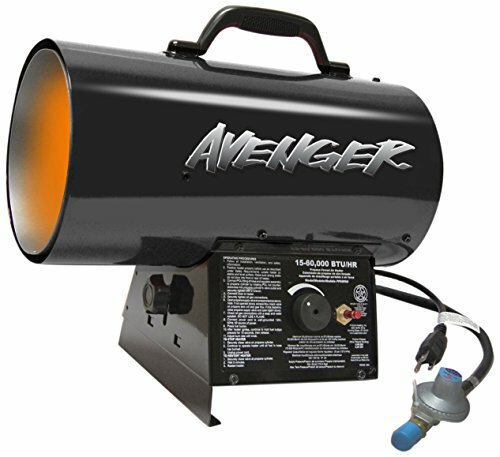 This heater is designed to be rugged, with its durability making it great for construction sites. The cord is very short, making it difficult to place. There is no thermostat, and none can be installed with this model. ​A good heater for construction work, this device is made from durable materials. It heats a garage quickly with its high-powered fan, but it doesn’t have a thermostat to keep the temperature even. 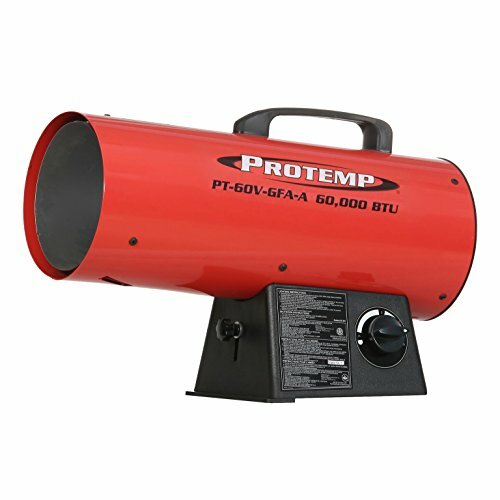 This portable forced air heater has 60,000 BTU of heat output. It has a durable black coating and is made of sturdy parts. The heater angle can be adjusted, and the push-button start makes for easy ignition. It has a big carry handle and is relatively lightweight. It is easy to transport using the carry handle. The motor is thermally-protected, increasing its longevity. This device comes all put together, and there is no need for installation. It has been certified to be safe to use on combustible flooring, making is safer for use in garages. There is no tip-over or overheat protection. This model isn’t the most effective in very cold environments. 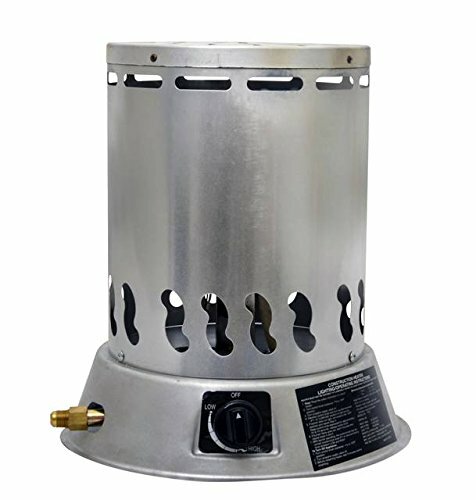 ​This simple heater is durable and has a long lifespan, and is easy to use from the get-go. It can be moved around without hassle but doesn’t have safety mechanisms to alert you if it falls over. Propane heaters can be a wise choice for a garage. With the power to deal with the drafty environment, propane heaters cope easily with heating garages. Choosing radiant or convective heat is up to you, as it is the portability of your propane heater. Always try to think of what you need to fit it into your space physically, as well as how it will be used in your life. This way you will find a product that meets all your requirements, within your budget.